☆☆☆☆ “Chris Lang’s Unforgotten was a thriller caked in the grit and moral ambivalence of the real world. His new six-part procedural Dark Heart (ITV) is something else entirely – a heightened revenge caper that casts London as a neverland of sodium-lit underpasses and tobacco-stained antechambers. It’s atmospheric and quietly riotous – but there is also a whiff of the experimental side-project about it. Lang is clearly eager to exit his comfort zone and, it is tempting to conclude, jolt his audience out of theirs’ too.” — Independent. 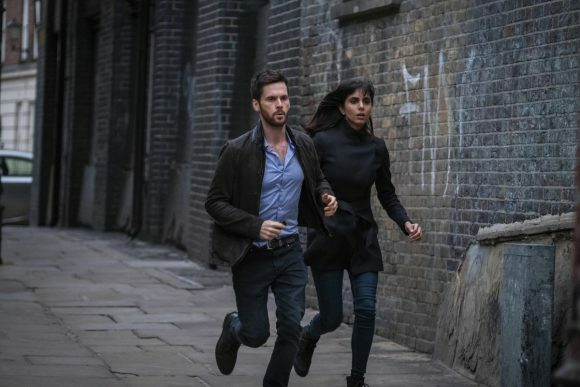 ☆☆☆☆ “The drama follows the work of DI Will Wagstaffe (Tom Riley) and his team as they investigate a gruesome murder, soon discovering that the victim was arrested two years ago on suspicion of sexually assaulting his stepdaughters. Is his death a straightforward revenge killing, or something more sinister? A quality thriller, it also stars Charlotte Riley and Miranda Raison.” — The Guardian. ☆☆☆☆ “Dark Heart feels old fashioned and formulaic in its execution. We have the troubled detective who’s suffering with personal demons, conventional police procedural scenes and a visual style which practically resembles the sepia filter – all of which is emphasised now its gruesome edges have been ironed out … The refreshing cast help lift its appeal, but this first episode doesn’t quite do enough to distinguish itself from the crowd.” — Metro. ☆☆☆☆ “As drama, it’s all a bit meat and two veg. There’s the regulation incident room banter and the cast seem mainly to have walked off the pages of a catalogue for urban casual knitwear. The makers are claiming they’ve toned the violence down from the pilot, but strong stomachs are recommended for the six episodes of blood-curdling revenge drama without much in the way of psychological insight to light the dark path.” — The Telegraph. ☆☆☆☆ “Dark Heart has a decent premise, but it’s not enticing enough – you are left firmly and unambiguously in your seat. It’s clearly reaching for a Luther vibe, mildly succeeding in its visuals with director Colin Teague and cinematographer Sam McCurdy creating a sickly yellow, Fincher-like atmosphere. But Lang’s script is often tedious and a bit predictable, and in this age where detective thrillers are everywhere, Dark Heart offers nothing new.” — Culture Whisper.